Dr.Sanak Mishra, the Ex-president, Indian Institute of Metals received the prestigious "Distinguished Merit Alumni Award", from the Department of Materials Science & Engineering of the University of Illinois at Urbana-Champaign, USA on April 23, 2010 at the Annual Awards and Banquet function in the University's Campus. After getting his Bachelor of Engineering degree in Metallurgy from the Indian Institute of Science at Bangalore, he had obtained the M.S. (1970) and Ph.D. (1973) degrees in Metallurgical Engineering from this Department. Dr. Mishra was fortunate to be Research Assistant to the famous Professor Paul Beck, one of the founding fathers of modern Physical Metallurgy. During this period, he had also collaborated with Dr. Simon Foner at the Massachusetts Institute of Technology (MIT), the inventor of the Vibrating Sample Magnetometer. His fundamental experiments at and below liquid helium temperature led to the discovery of magnetic clusters in dilute alloys of iron and was published at that time in a series of more than ten papers in leading American and European Physics journals. He has been told that this is the first time that a person has been selected who has spent his entire professional career outside the United States. For the award, besides considering his work in Illinois on magnetism, the Selection Committee also took into account his work on the genesis of the crystallographic textures in body-centred-cubic metals in Aachen as Alexander Humboldt Fellow, plus his track record in the steel industry. It has been noted that established in 1867, the University of Illinois at Urbana-Champaign (UIUC) is consistently ranked as one of the Top-5 Engineering Schools in USA, by the highly respected magazine "US News and World Report". 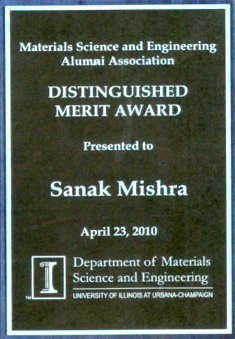 The Citation of this award to Dr Mishra reads: Sanak Mishra (MS Met '70, PhD Met '73) carried out his graduate studies with Prof. Paul Beck. He is presently the Chief Executive Officer of the India Greenfield Projects of ArcelorMittal, the world's largest steel company. He is the President of the Indian Institute of Metals, India's premier professional organization of Metallurgists and Materials Scientists engaged in industry, research and academia. Dr. Mishra is well known as the architect of the "SAMSKAR" concept, which is a unique code of leadership practice. He designed and implemented it when he was handed over the charge of the then heavily loss-making Rourkela Steel Plant, as its Managing Director, and brought about a dramatic transformation and a remarkable financial turnaround. He was a Member of the Board of Directors of the Steel Authority of India Limited during 2002-05. He was Alexander von Humboldt Fellow in Germany during 1980-81. He was honored in 2009 by the Indian Institute of Science in Bangalore with the "Centenary Year Distinguished Alumni" Award. A technologist of international reputation, he received the prestigious National Metallurgist Award of the Ministry of Steel, Government of India in the year 2003. He is Fellow of the Indian National Academy of Engineering and the National Academy of Sciences and Member of the Asia-Pacific Academy of Materials. Copyright © 2016, IIM. All rights reserved.